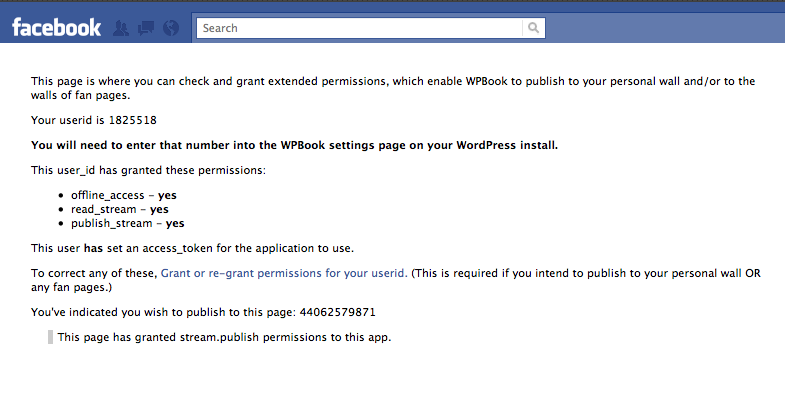 These settings all impact how WPBook publishes to Facebook walls, and depend on appropriate permissions being set in Facebook. Inside the WPBook setting panel in your WordPress Dashboard (Dashboard->Settings->WPBook) Click on the “+” next to Stream/Wall Options. This will open up the streaming option panel. To post to YOUR (individual wall) you must enter your Profile ID under “YOUR Profile ID.” Likewise, to post to a Page you must enter the Page ID under “Page ID.” If you don’t know your profile or page Id click “Check Permissions” link. You will be taken to a page which shows your ID’s. From now on, whenever you publish a new blog post, an excerpt from that blog post should be automatically posted to your personal Facebook wall. If posting to Facebook wall is not working, enable the “Show errors posting to Facebook Stream” setting and try again (unpublish and republish a post). If you still need help check the support forum for help. To enable this setting just click “Import comments from Facebook Walls.” This will enable checking for new comments on wall post every hour. Automatically approve imported wall comments. If this is NOT selected, comments imported from Facebook walls will await moderation in WordPress like other comments. Note that since these comments will all appear to WordPress to come from the same email address, you may not see all comments for moderation, depending on your WordPress settings. 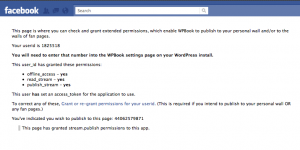 For how many days should WPBook look for comments on Facebook Walls? It is recommended keeping this setting relatively short. Facebook Wall posts tend to disappear from view after a few days, and the longer period of time WPBook needs to look back for posts, the more resources will be consumed by the cron job which does the checking – it may even time out and start to fail. What email address should WPBook associate with imported comments? This setting is provided for those of you who use gravatars on your WordPress blog. You can create your own email address and associate a gravatar to it, or just use facebook@openparenthesis.org which has a nice facebooky avatar.